Storefronts have a certain captivation for photographers – both amateur and professional alike. Last year saw the publication of “Brooklyn Storefronts” by Paul Lacy, an avid bike rider who captured hundreds of images of places he wanted to remember while he rode around the borough. This year brings us “Store Front: The Disappearing Face of New York City,” out on Gingko Press this year. In addition to presenting the vibrant images of barber shops and liquor stores, the book’s photographers, James and Karla Murray, documented generations-old stores in the city, places that have persisted for years as Starbucks and other chains cropped up around them (though now, in this faltering economy, seem to go the way they came), places that give a neighborhood its charm. The initial seed for the project was planted when the Murrays were scouring the city for graffiti for a completely different project. What they increasingly saw were the quick changes that occurred on a block, completely changing its character as these staples disappeared or were forced due to zoning regulations to modernize their signage. It was then that the pair made it their mission to document these stores, covering the five boroughs and breaking up the shots by neighborhood. As of publication, one-third of the documented storefronts had closed, and the numbers are sure to be rising. In Coney Island, a part of the borough that’s been disappearing with each passing summer, wide shots reveal the carnival aspect of the boardwalk, with storefronts shilling frankfurters, Italian sausage, cold beer, cotton candy and hot pizza. The stretch at West 10th St. is equally bittersweet as it captures (cica 2005) the Astroland Park sign – rocket and all – that was dismantled late last year. Another example of change is the Long Island Bar and Restaurant on Atlantic and Henry, which put up a “closed” sign in 2007 and has remained such since (published reports at the time say the move was only a temporary one, as the owners were taking time off for personal reasons). In “Store Front,” the beloved diner was captured in 2004, alive and well, an American flag in its window. An interview with the owner informs us that the restaurant opened in 1951, back when Brooklyn was considered part of Long Island (a statement no Brooklynite would utter today). Other interviews with owners reveal fascinating facts about the city’s recent history. For instance, the birthplace of the teddy bear, next door to Jimmy’s Stationary & Toys in Bedford-Stuyvesant, had President Theodore Roosevelt’s personal blessing. Cobble Hill’s Court Pastry is one of the last places in the city to get a cannoli made the old-fashioned way – by hand. One of the challenges posed to photographers trying to shoot storefronts is dealing with bustling city streets, full of people, parked cars and locked up bikes. To capture their exquisite block-long views of storefronts, with lines of hair stylists, lunchonettes, laundromats and pastry shops unobstructed, such as on New Utrecht Avenue at 72nd Street in Bensonhurst, the two took multiple photos of stores using their 33 mm cameras and combined them digitally to preserve the street view for posterity. 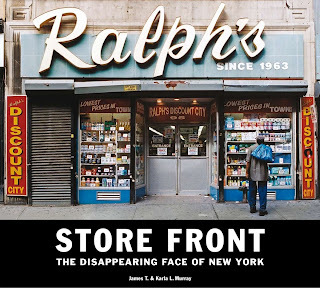 “Store Front: The Disappearing Face of New York City” (Gingko Press, $65) is available for purchase on Amazon. James and Karla Murray will be in Brooklyn on April 16 at Book Court (163 Court St.) for a lecture, signing and Q&A beginning at 7 p.m. While in the neighborhood, hop on down to Court Pastry (298 Court St.) beforehand for a hand-rolled cannoli.